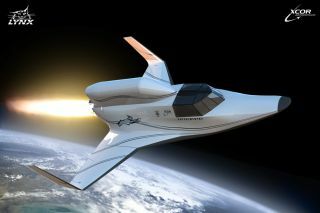 The California-based spaceflight company XCOR Aerospace has inked a deal to take scientists and their experiments on six flights to suborbital space on a two-seat space plane. The Southwest Research Institute (SwRI), a non-profit research organization, has purchased six trips aboard XCOR Aerospace's Lynx vehicle, XCOR officials announced Thursday (Feb. 24). The Institute announced today (Feb. 28) that it also signed a deal with rival private spaceship company Virgin Galactic for rides aboard that firm's SpaceShipTwo space plane. These contracts mark a first for the resusable suborbital launch vehicle industry, officials said. The XCOR Aerospace Lynx space plane is a two-person spacecraft designed to take off and land on an airport runway. Each Lynx flight will carry a SwRI scientist, XCOR officials said. The researchers will perform a variety of biomedical and astronomy experiments onboard, taking advantage of suborbital space's lower gravityand clearer views of the cosmos to perform projects they couldn't pull off on terra firma. SwRI bought six flights on the Lynx but retains an option to purchase three more, XCOR officials said. "SwRI is a recognized leader in the field," said Jeff Greason, CEO of XCOR. "They are one of the best research firms in the world for space science and engineering, and their researchers have a phenomenal ability to explore innovative concepts. I look forward to the pioneering work this partnership will achieve." This diagram from XCOR Aerospace shows where science payloads will be placed on its Lynx space plane during suborbital spaceflights. Research trips on the rocket-powered Lynx have the potential to be quick and highly repeatable. Experiments could go from the runway to suborbital space and back again within 30 minutes, XCOR officials said. And XCOR will be able to fly the vehicle up to four times per day. The Lynx can carry experiments within its pressurized cabin or externally, exposed to the thin air of the upper atmosphere. It can haul a total payload mass of 1,430 pounds (650 kilograms) or so, and Lynx flights cost about 90 percent less than traditional rocket operations, XCOR officials said. XCOR and SwRI did not announce when the research flights would begin. The Lynx is still under development, and Greason has said that the vehicle's first test flights could take place sometime this year.